UTILIZATION:	Hunting dog above and below ground. CLASSIFICATION F.C.I. : Group 4 Dachshunds. The Dachshund, also called Dackel or Teckel, has been known since the Middle Ages. From the «Bracken», dogs were constantly bred which were specially suitable for hunting below ground. 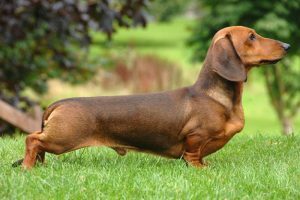 From these short legged dogs, the Dachshund evolved and was recognised as one of the most versatile and useful breeds of hunting dogs. He also has excellent achievements above ground, hunting while giving tongue, searching and tracking wounded game. The oldest Club devoted to the breeding of Dachshunds is the «Deutsche Teckelklub» e.V., founded in 1888. With the distance above ground level of about one third of the height at withers, the body length should be in harmonious relation to height at withers, about 1 to 1,7 — 1,8. Jaws / Teeth: Well developed upper and lower jaw. Scissor bite, even and closing firmly. Ideally, complete set of 42 teeth according to requirements for a dog’s mouth with strong Canines exactly fitting into each other. Eyes: Medium size, oval, set well apart, with clear energetic yet friendly expression. Not piercing. Colour bright, dark reddish brown to blackish brown in all coat colours. Wall, fish or pearl eyes in dapple dogs are not desired but may be tolerated. General: Strongly muscled, in correct proportion to forequarters. Strong angulation of stifles and hock joints. Hindlegs parallel standing neither close nor wide apart. b) Two-coloured: Deep black or brown, each with tan or yellow markings («Brand») over eyes, on sides of muzzle and of lower lip, on inner edge of leathers, on forechest, on inside and rear side of legs, also on the feet, round the vent and from there reaching to about one third or one-half of the underside of the tail. Nose and nails black in black dogs, brown in brown dogs. White is not desired but single small spots do not disqualify. Tan or yellow marking («Brand») too wide spread is undesirable. The absence of teeth other than those described among «faults» or «eliminating faults». Black colour without any marking («Brand»).